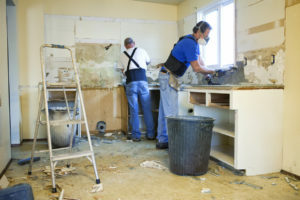 Home › Next Insurance Blog › General Contractor › Handyman vs. General Contractor: What’s the Difference? You offer good customer service, do your job well, and charge a fair price – so who cares what you call yourself? The answer: your customers. Although there are a lot of similarities between a handyman and a general contractor, how you choose to market yourself makes a big difference. Using the right title can keep you from wasting time on potential customers that won’t hire you and help attract the people who are looking for exactly what you can provide. That’s why it’s important to decide exactly what services you want to offer, who your target audience is, and which word best describes you. In most states, there is no licensing or certification requirement to call yourself a handyman. You still need a diverse group of skills to succeed as a handyman, but no licensing requirement means you can charge lower prices and take on jobs that may not be worth the large investment required of a general contractor. The licensing process to become a general contractor varies widely between states and even cities. For example, New York requires extensive documentation and California demands experience and an exam. Of course, this comes along with certain advantages: in California, jobs over $500 require a contractor license and dealing with dangerous systems, like electricity, requires a license everywhere. This difference in licensing requirements leads to a difference in the jobs that handymen and contractors can take on, even in states with no specific price guidelines. The larger a job, the more likely it is that it will require some kind of specialist: electricians, flooring installers, tiling experts, etc. That means multiple people will be involved in the project and a general contractor can serve as a coordinator between them, helping to maximize efficiency and ensure quality control. A handyman, however, is a better choice for smaller jobs that require just one person. Depending on your resources, you may not have a choice between becoming a handyman or a general contractor. General contractors often have experience in construction or even specialized training. In some states, they may have to pass exams or undergo extensive background checks. Big projects also need more resources over the long term, including equipment and broad general contractor insurance coverage. Meanwhile, handymen can do a short course or even get started working right away. Although handyman insurance is still important, they often need a simpler policy since it doesn’t need to cover as high a number of subcontractors or specialized tasks. Because the stakes are much lower, customers often require fewer references and credentials for a handyman than a general contractor. This means that it can be easier to find handyman jobs, even if they are less lucrative than contractor jobs. Are you a Handyman or General Contractor? How much time and money do you want to invest at the beginning? Do you like being independent, or do you prefer building and managing a team? If you prefer independence, being a handyman could be right for you, while general contractors often manage teams. Are you willing to spend days, weeks, or even months on each project, or do you prefer to finish a task quickly and move on to the next one? General contractors often spend a long time on each project, while handymen can finish multiple projects in a shorter period of time. Answering these questions can help you get an idea of what sets you apart from your competition, which you can then communicate to your potential customers. Deciding whether you call yourself a handyman or a contractor is just the first step in that process.